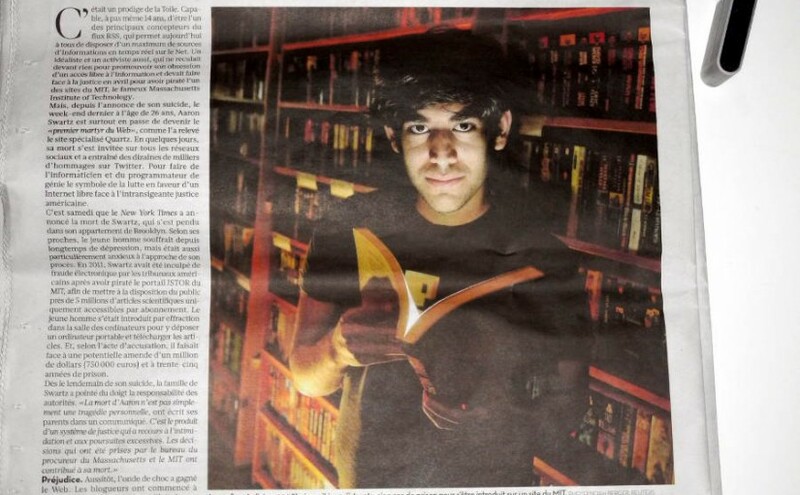 I didn’t know Aaron Swartz. And yet his tragic end touched me a lot. I saw some friends and colleagues react strongly in the weeks following his death, as strong as you can be in front of a tragedy at least. Aaron was only a few years younger than me. He had achieved so much, in so little time. He was an hero. He is an hero. I was deeply touched and I am still sad especially because I do the kind of things that Aaron did, although on a much smaller scale. I am not an hero, of course. In 2008 I started collecting air pollution data from a local government office. Everyday, one PDF. Later I started writing web scrapers for this dataset and others. I never really got to the point where the data could be of any use. Most of this was done out of frustration. In 2009 I got a PhD scholarship from my university and with that came a VPN account that I could use from anywhere to access digital resources for which the university had a subscription (including part of JSTOR). I gave those credentials to several friends who had not the same privilege I had, and I didn’t worry, even though those were the same credentials used for my mailbox. You cannot even try to move your first steps into an academic career without access to this kind of resources. I regularly share digital copies of prints, especially the incredibly awful copies made by photographing a book. Every single person I have been working with in the last three years does this regularly: scans, photographs, “pirate” PDFs or even pre-prints, because everything will do when you need a piece of “global” knowledge for your work. I have to break the rules so regularly that it feels normal. And yet, I don’t feel guilty for any of that, except for the fact that I didn’t take the next step with access to knowledge, giving to everyone and not just to a small circle of people. Sometimes between 2008 and 2009 I helped making a copy of the entire archive of BIBAR (Biblioteca di Archeologia, mostly about medieval archaeology), hosted at my university. That’s more than 2 GB of academic papers, the same kind of content that Aaron took from JSTOR. Years later, that copy lives as a Torrent download, out of any restriction. It’s a small #pdftribute for Aaron.